Chains and necklaces require a secure binding in order to safely and easily attach them to your neck, this is where the Clasp is introduced. Clasps fall into the category of jewellery finishing pieces known in the industry as "Findings". There are numerous styles of clasps for chains so we will focus on the most common styles for now however, keep in mind that there are also Magnetic clasps, Friction clasps, Cartier clasps (similar to Lobster clasps), Albert Swivel clasps, Snap-Lock clasps, Slide-Lock clasps, S-Hook clasps and Trigger clasps even though these styles are far less common or simply variations of others listed below. This is a classic among clasps, slender and unassuming, the Bayonet clasp makes for a well-formed and safe ending. It is operated via a push and twist motion to securely connect and disconnect the clasp. Unable to be used with chain, the bayonet clasp is suited for use with solid or woven leather as well as rubber or rope cord. Either is simply inserted into the ends of the clasp with a small amount of jewellers glue or similar tough adhesive. For an example of the Bayonet Clasp in action, take a look at our Leather Necklaces. Also commonly referred to as the Spring Ring clasp, whether large and decorative with a double ring, or small and simple, Bolt Rings are safe and popular clasps. As their alternate name suggests, Boltring clasps are spring loaded which ensures the mechanism always closes, hence their popularity as a secure finding. To see a Spring Ring Clasp attached to a chain, have a look at our Sterling Silver Ball Chains. Lobster Clasps are easier to use than Spring Rings and have a more streamlined design. Reminiscent of the claw of a lobster hence their name, Lobster clasps are a curved version of the Parrot Clasp and similarly spring loaded. View an example of a Lobster clasp attached to a leather bracelet here. Parrot Clasps are a more square version of the Lobster. 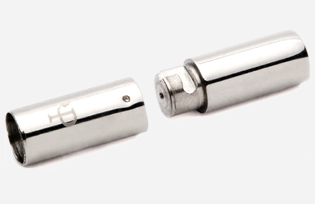 They are a spring loaded fastener used to connect both ends of bracelets and necklaces and usually come with a jump ring at the end which is then soldered to completely secure the clasp. 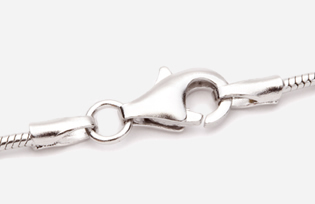 Several of our sterling silver bracelets utilise the Parrot clasp for example the Oval Belcher Bracelet. View our beautiful collection of chains and necklaces.